I hope many of you are enjoying the opportunity to catch Jewel live on her current Picking Up The Pieces tour. The emotional intensity of this album continues to delight old school fans while the depth and range of the songwriting seems to be catching many new listeners by surprise. 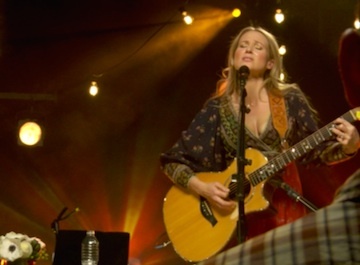 Not surprisingly, the material and monologues on this tour find Jewel reflecting on her life more intentionally than any other time in her career, while embracing, rather than shying away from, autobiographical repertoire like “Goodbye Alice In Wonderland.” Suffice it to say its a prime time to catch her in a solo acoustic context. The circumstances that fueled Picking Up The Pieces are familiar to anyone reading my blogs, so I need not repeat any of that, but I would like to share what I believe to be the initial spark of that creative cycle. It actually dates back to September of 2012, when Jewel first wrote some of the initial elements of a potential song, then tentatively titled “The Sound Of Two Hearts Breaking.” There was a lot going on careerwise that month. Alantic Records was preparing a Greatest Hits album, “That’s What I’d Do” would be published in a few days (Jewel’s first children’s book) and meetings with the three arrangers for the holiday album project, Let It Snow, were in progress. When we first logged that initial writing demo that September, it was merely a skeletal memo for future reference. About a month later Jewel began fleshing it out, with four more writing demos occurring during October. At the time, she was also prepping for co-writing activities, expecting a new single to result, but “Two Hearts Breaking” was essentially written by then and not being considered. I clearly recall Jewel telling me that she doubted she would even share the song. In early November she decided to approach it again by booking a Nashville studio (with Jay Joyce on guitar) to record a proper demo of it. This demo session led to Jewel working with Jay Joyce as producer on the official recording, where it would indeed become her next radio single and the closing track on her Greatest Hits album. I’d like to share with you some captivating footage of the public debut performance of “Two Hearts Breaking.” All the previously unseen images in this blog are also from that same evening at the iHeart Radio Theater in New York City. Several EDAs attended this event and many more will remember it being webcast live in conjunction with the album release. It remains the most elaborately shot webcast Jewel has ever done, utilizing 7 cameras and dozens of crew members. In terms of webcast production values, it was phenomenally well done and I dare say nobody has ever done it better. Terrific as it was, I’d like to share something slightly different with you. That would be raw outtake footage of the song, all shot on a single camera from dead center in the second row. All I did was excerpt the song and synchronize a multitrack mix of the audio to it, since the original camera audio was clipped to the point of being unlistenable. 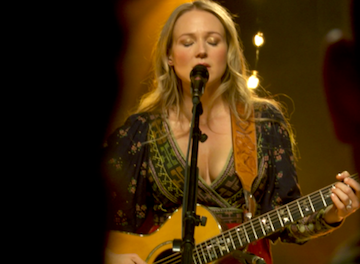 Particularly during the last minute or two, I think this single camera conveys the intensity of Jewel’s performance even better than the elaborately edited camera switching version that many of you may be familiar with. So... lets travel back to February 5, 2013 to have a new look and listen to the public debut of "Two Hearts Breaking" - the precursor to the dark creative cycle that culminated in Picking Up The Pieces.